All last week, I did Christmas cards for the daily challenges at Catch the Bug. Today, I have one last Christmas in July card but this time the image is from AuroraWings. 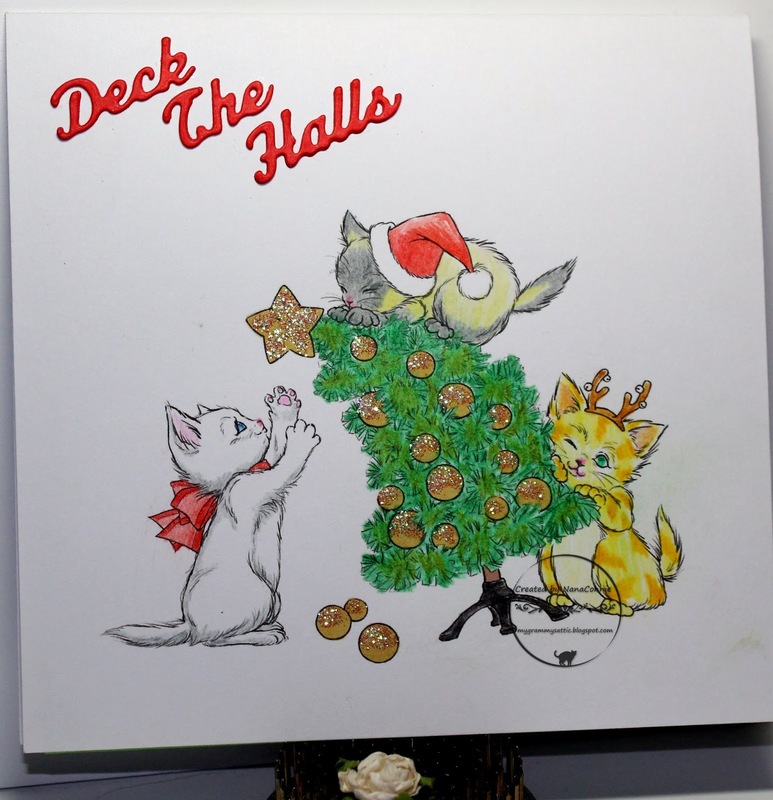 While their challenge theme has nothing to do with Christmas, how could I resist these adorable felines? I got this image back in January and I've been waiting to use it so this week seemed the perfect time. The image is printed right onto the card front for a very CAS design and I colored it with polychromos pencils, plus I added glitter to the tree ornaments. The sentiment is done with a die from Die-Versions. I cut it three times from red CS, stacked those together and glued them with a glue pen, then added them to the card front. The stacking gives some great dimension but also adds texture. A CAS card, easy to mail. This will be the last Christmas card for a couple of weeks. But now that I've gotten a start, I'll be doing two or three each month for the rest of the summer, then I do at least one a week through the holidays. I get my stash built up each year because I need 20 to 25 for family and close friends, and then I donate 50 to 75 to my local senior center. I started doing that when I moved here 5 years ago. It happened quite by accident. My first Christmas in my new home, I was busy unpacking through the late fall and finally ran across a box of Christmas cards I had done for family but by the time I found them, I had already made and mailed new ones because I couldn't find that particular box. The senior center is literally 2 blocks away and I passed it on my way over to my daughter's house the very day I found the cards. I turned around, went back to the house, grabbed the box of cards, and took it over to the Senior Center just to see if anyone might be interested in having cards for their own family and friends. I knew some of those attending activities at the center really don't have adequate transportation to get out to the Hallmark store to buy cards for family and friends. There were only about 20 or so but I understand they were all taken that very afternoon. The next year, I did an extra 25 cards specifically to take to the Senior Center. By year three, the center manager called me on December 1st to ask if there was any chance I was bringing cards that year also. It seems she had requests and inquiries from many of the seniors asking if there would be cards that year. :-D Now I make as many cards as I can for the Senior Center and every year I get wonderful feedback and warm "Thank You"s so I keep on doing it. Oh my Connie, a simply adore this gorgeous card and such an adorable image too. I love this stamp Connie! Great CAS card. Oh my sweetness! I love that sweet image and you colored it beautifully! Connie, that's wonderful about you how you donate so many cards there! Wow!!! I know each and every one is appreciated so much too. Love this one and those playful little kitties! Precious card. What a fantastic use of those found cards! And what a wonderful yearly activity for you. As for the card, I'm assuming it's un-decorating!! What an adorable card with beautiful coloring. Thank you for joining us at Die Cuttin' Divas this week! Love your giggly (for me) card. What a wonderful idea for the OLD folk! Sweet card!!! Thanks so much for participating in our CHRISTMAS CRAFTS ALL YEAR ‘ROUND challenge. Hope you participate in our next challenge!! Have a happy crafty day!!! I love what you've done with these rascals for this wonderful CAS card!! The added sparkle on the ornaments, and dimension from the sentiment are the perfect ways to amp this up a bit!!! Thanks so much for sharing your adorable creation in our ATG challenge! What a super card Connie. If they are anything like mine used to be it will definitely be undecorating the tree! Lol. Thanks for joining in with our Anything Goes challenge at Aurora Wings this time. Good luck.